North Georgia has a strong and well-documented tradition of Hillbilly music. The Fiddler’s Conventions, Fiddlin’ John Carson and Moonshine Kate, Gid Tanner and the Skillet Lickers, Riley Puckett and others contributed to the wealth of music in the first half of the twentieth century. Contemporaneously with these golden years of Hillbilly music, one man heard a different sound and set about assembling the components needed to create that sound. In 1938 Bill Monroe traveled to Atlanta where he advertised for musicians and subsequently hired a young guitarist from North Georgia named Cleo Davis. From this origin Monroe would soon name his group the Blue Grass Boys and begin to create the branch of Hillbilly music which would one day be known as Bluegrass. By 1946 Monroe’s distinctive sound was complete and had begun to draw imitators. By the 1950’s in North Georgia as in other areas, the influence of Monroe, the Stanley Brothers, Flatt & Scruggs and Jim & Jesse McReynolds was seeping into the Hillbilly or country music of the day. The year 1965 brought the first ever multi-day Bluegrass Festival, held in Fincastle, VA. and by 1968 the core group of bluegrass fans in North Georgia had organized the very first such festival in Georgia, held in a transmission repair shop in Austell, GA. This was the first of dozens to follow. They ranged from small community events with a few amateur bands to large, well-established festivals featuring the best the genre had to offer. In the early 80’s the Southeastern Bluegrass Association was established to foster the music and the number of bluegrass bands was counted in the dozens. 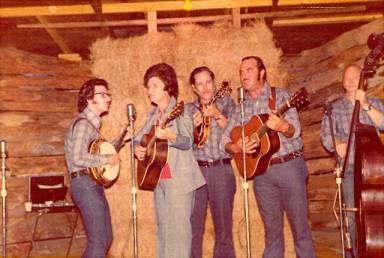 Bluegrass music was establishing it’s own tradition among the disciples in North Georgia. 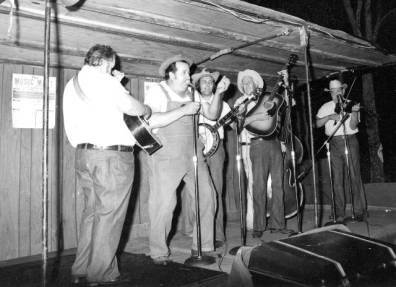 Among the earliest, most dedicated and enthusiastic performers and promoters of the music in North Georgia are J. N. and Onie Baxter, Murray Freeman and James Watson. J. N. and Ione (Onie) Baxter have been the nucleus of the Bluegrass Five for over 39 years. After marrying in 1954 the couple regularly made music with friends and neighbors wherever they were living. Onie learned mandolin and guitar as a small child and J. N. was a natural singer who learned guitar from his young wife in the early days of their marriage. Both had been introduced to the banjo, mandolin, guitar and fiddle but found themselves drawn more to the acoustic sound than to the electric guitars of their peers. 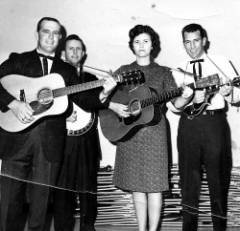 In 1961 the guitar playing couple joined with mandolin player Hughie Wylie, bassist Howard McGuire and banjo player Joe Will McGuire to make their version of bluegrass music. Two years later they were dubbed the Bluegrass Five by Howard McGuire. a. L-R: J.N. Baxter, Joe Will McGuire, Onie Baxter, Hughie Wiley, Circa 1963.
b. L-R: J.N. Baxter, Howard McGuire, Ron Norman, Hughey Wiley, Onie Baxter, Circa 1966. The bluegrass community in the area was small but through their limited contacts they learned there was a bluegrass contingent that regularly attended the Ashville Folk Festival in North Carolina. From their first exposure to the festival they became an integral part of this community of likeminded musicians playing “real live” bluegrass music. Over the next few years they would meet and pick with many of the greats of the music. Back in Georgia the Bluegrass Five was much in demand, not only at the small rustic Wanda Auditorium in Bowden Junction, Ga. but also at major festivals across the south. During these years they performed at Union Grove, NC, the Lavonia Bluegrass Festival, the Mountain Dance Folk Festival, the Hiawassee Mountain Fair and shared bills with the likes of Flatt & Scruggs, Monroe, the Chuck Wagon Gang and many others. One favorite memory involved playing two shows with Monroe’s legendary fiddler Kenny Baker at the Lavonia Bluegrass festival. 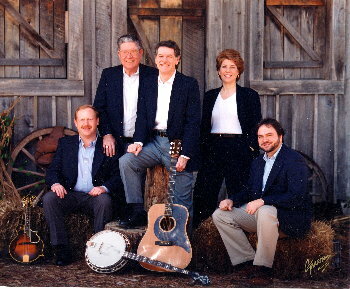 Although J. N. and Onie have been the constants in the Bluegrass Five, many other great musicians have passed through the group. Among them were Ron Norman, Joel and Erlene Aderhold, Ralph Abernathy, John Farley, Mack Farley, Jeff Barr and the Baxter’s youngest daughter Jane Baxter. L-R: Mack Farley, Jr., Onie Baxter, Ralph Abernathy, J.N. Baxter, Ron Norman, Circa 1974. In addition to everything else J. N., Onie and the Bluegrass Five have accomplished during their more than 40 years in bluegrass they have provided support and encouragement and have been a great role model for hundreds of younger musicians who have been influenced by them and their music. In recognition of their contributions they were inducted into the Atlanta Country Music Hall of Honor in 1998 and in 2001 were installed in that organization’s Hall of Fame. J.N. and Onie Baxter – Atlanta Country Music Hall of Honor. 1998. Murray Freeman grew up in Arkansas and vividly remembers listening to the Grand Ole Opry on a battery-powered radio. The music of Webb Pierce, Hank Williams, Hank Snow and the other Opry stars of the day was a major influence in his decision to play guitar and perform Hillbilly music. Murray’s first guitar was obtained for him by his mother on a rental plan. The plan included the use of an inexpensive guitar and a weekly lesson on the instrument. In the early 1950’s, married and doing his military service at Camp Lejeune, North Carolina, Murray met a fellow Marine who was an able guitarist. This allowed him to continue to improve his guitar skills, however this period was more important for a coincidence of geography. During this same time Lester Flatt, Earl Scruggs and the Foggy Mountain Boys were regular visitors to the schoolhouses, theaters and other music venues in the area. At least twice monthly Murray and wife Barbara would travel 50 or 60 miles to see them perform. These trips instilled in Murray a great respect for and love of this style of music. After leaving the service Murray settled in West Georgia where he continued playing music as an avocation. In time he met others in the area who were playing the Flatt & Scruggs style of music and by the mid 60’s he was an active member of the small but growing bluegrass community. He began making the trip to the Ashville Folk Festival with J. N. & Onie Baxter and the Bluegrass Five. By 1966 he had formed his band, the Ridgerunners, which was to become one of the most prominent groups in the area for the next 20 years. 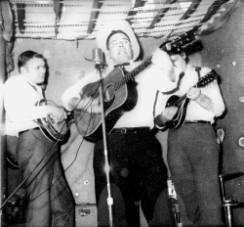 The original group was Dillard Rogers on bass, Murray and Charlie Abernathy on guitars, Ralph Abernathy on mandolin and Paul Rogers on banjo. This group was among those involved in hosting the first official bluegrass event in the area in 1968.
a. L-R: Kenneth Hood, Murray Freeman, Ralph Abernathy, Circa 1963.
b. L.R: Paul Rogers, Charlie Abernathy, Ralph Abernathy, Murray Freeman, Dillard Rogers, Circa 1966. 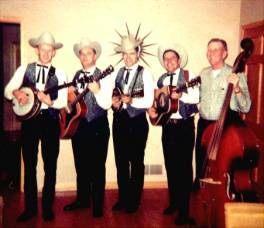 Over the years the line-up of the Ridgerunners went through the inevitable personnel changes with each configuration maintaining the traditional hard driving bluegrass sound which was their trademark. In 1977 the band entered the studio and produced their only commercial recording. “Down Home Pickin’ & Singin’” was a collection of songs which showcased their dedication to traditional bluegrass music. 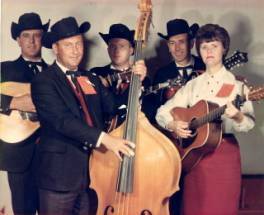 At this time the group included Murray, his daughter Connie who had joined the group several years before on banjo, Tommy Nations on mandolin and Lee Melton on bass. During this heyday, from the mid 60’s well into the 80’s, no other group was more respected in the North Georgia area and in surrounding states. Murray became particularly known for his energetic delivery of songs from the repertoire of Jimmy Martin. 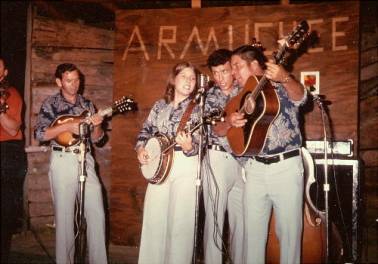 L-R: Tommy Nations, Connie Freeman Morris, Lee Melton, Murray Freeman, Circa 1976. 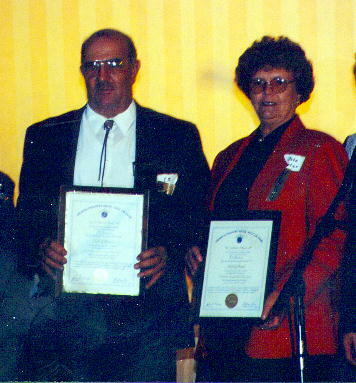 After more than 20 years as bandleader, Murray disbanded the group to focus more on his career in the sheet metal industry, however, he was never completely removed from the bluegrass community as his daughter Connie Freeman Morris continued to perform as a member of Cherokee Rose and other groups. By the late eighties, Connie had followed Murray’s lead and formed a new group, Georgia Bound, and had enticed Murray out of retirement as a regular part of the band. In 1998 he was honored by induction into the Atlanta Country Music Hall of Honor. L-R: Tracy Burdette, Murray Freeman, John Farley, Connie Freeman Morris, Mike Patton. Georgia Bound continues the tradition begun by Murray’s Ridgerunners. They are a highly professional and well-respected group and an integral part of the North Georgia bluegrass community. Banjo player James Watson could be considered a strange choice to be recognized as a North Georgia Bluegrass Pioneer for two reasons. He doesn’t live in Georgia and he doesn’t play banjo in the traditional 3 finger Scruggs style. However, as an 18 year veteran of the band The Golden River Grass, he became an integral and influential member of the bluegrass community. James first musical memory is of an uncle playing “Shout Little Lula” on a banjo in the rapping or clawhammer style. James recognized as a small boy that he too would someday make music on the banjo. Growing up in and around Roanoke, Alabama, James was introduced to a well- known local fiddler named Pappy Lee Farmer and in 1947 he joined Pappy and others in his first band, Pappy Lee and the Chillun’. Through Pappy’s efforts the group soon had a Saturday radio program on WLR in Roanoke as well as a sponsor and stage costumes. 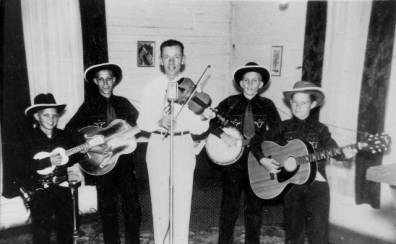 By this time James was also playing guitar and would teach the banjo parts to Pappy Lee’s son who was in the group. This configuration continued for several years as the boys matured and became Pappy Lee and the Playboys. James credits Pappy with improving both his musicianship and his stage presence. Pappy Lee and the Chillun’, Circa 1947. Because James’ home area was very near the Georgia – Alabama line he regularly ranged into Northwest Georgia playing and attending musical events. 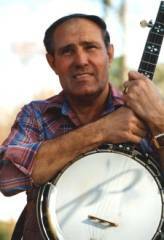 In 1965 he heard the Bluegrass Five for the first time and saw, in person, a 3 finger Scruggs style banjoist. The player was Ron Norman. As others were doing, James began to follow J. N. & Onie Baxter to bluegrass events across the southeast. J. N. Baxter has observed that during this period he always expected to look in his rearview mirror and see James Watson riding on his bumper. By this time James had returned to the banjo as his main instrument and had developed his own technique, which was a variation of the traditional clawhammer style. As he became more involved in the bluegrass scene he modified his style into one more compatible with the hard driving rhythm of the music around him. In the mid 60’s James took his first trip to Nashville, Tennessee, where by chance he met Roy Acuff and Bashful Brother Oswald at a downtown music store. Encouraged by his good fortune he then decided to look up the address of one of his heroes, Earl Scruggs. Once again by chance, as he approached the Scruggs home Earl was standing by the mailbox. After a brief conversation James was invited in for a visit where he bought a Scruggs tone ring for his banjo for $33.00. He now admits that he left disappointed because Earl didn’t have a new one available and he had to settle for one that was taken from Earl’s second banjo. After his introduction to the Georgia bluegrass community James became a regular at the festivals, shows and get-togethers. By 1974 the original Georgia festival had grown into a large and successful event promoted by Dillard Rogers at the North Georgia Fairgrounds in Marietta, GA. James remembers walking across the festival grounds and hearing someone preaching in the distance. As he approached he realized the preaching was interspersed with harmonica music. The preacher was John “Doodle” Thrower, a natural entertainer and West Georgia legend, who would for entertainment purposes, occasionally stop blowing his harp and singing long enough to deliver an impromptu sermon on some topic related to the events around him. James shouldered his banjo and joined in the show. After a few tunes it was obvious to Doodle that he had found a banjo player with both the style of playing and the stage presence to complement the sound of his group the Golden River Grass. For the next year James was used as a fill-in but by 1975 was accepted as a full time member of the most raucous, energetic and entertaining group on the regional circuit. While the group was more akin to an old-time string band their music was close enough to bluegrass to be accepted by the entire community. L-R: Len Elliott, ‘Doodle’ Thrower, James Watson, C.J. Clackum, Gene Daniel (background), Bill Kee, Circa 1976. Over the next 18 years Doodle and the Golden River Grass traveled the Southeast performing their music. They were discovered and embraced by the National Council of Arts and were invited to perform at festivals in Dover, Delaware; Mountain View, Arkansas; Wolf Trap, Virginia and the World’s Fair in Knoxville, Tennessee. James and Doodle were also honored in The Georgia Music Hall of Fame in Macon where several artifacts related to the band are on exhibit. 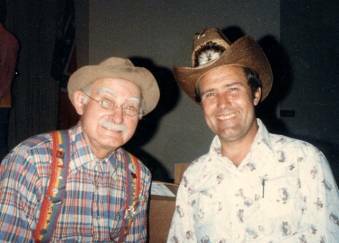 Among James’ proudest moments was meeting Grandpa Jones and being invited to play onstage with him. The two developed a friendship, which resulted in several subsequent joint appearances. L-R: ‘Grandpa’ Jones, James Watson, Circa 1987 and James Watson, Circa 1999. Doodle Thrower passed away in 1993 and shortly thereafter the Golden River Grass disbanded. James states that it was a great honor to part of the Golden River Grass and that “finally Doodle got enough notoriety that we were making gas money, but I would have played anyway and paid them”. The North Georgia bluegrass community today is larger and more diverse than ever and while there have been many people who contributed to the great tradition of Bluegrass in the area, none are more respected than J. N. & Onie Baxter, Murray Freeman and James Watson. They were among the first to embrace and promote bluegrass music in North Georgia and continue to perform and influence those who follow. They are our heroes.